Our best selling operator! Powerful, quick, and convenient with smooth and whisper quiet operation. Available in belt and chain drive. 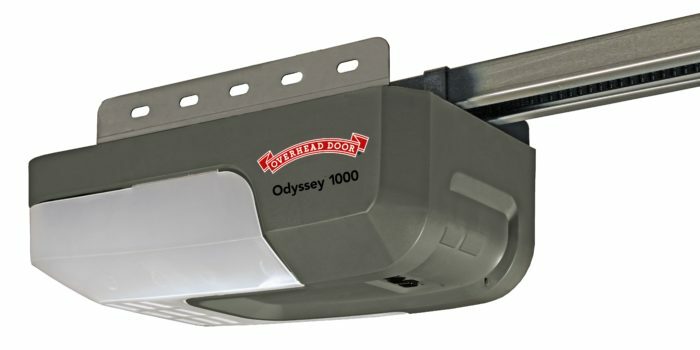 The Odyssey® 1000 home garage door opener delivers power and speed with its 3/4 HPc* motor and is available with either a chain or belt drive. With softer starts, the wear and tear on garage doors is reduced and its quiet and powerful operation can operate almost any garage door conveniently. Its monitoring system, the DoorDetect™, improves overall safety. Available in Belt and Chain Drive 15 year limited belt warranty, 5 year limited chain warranty. DC Power The Odyssey 1000® offers quiet yet powerful 3/4 HPc* DC motor. Opening speed: Up to 7.5 in/second. Safe-T-Beam® System Safe-T-Beam® System is self-diagnostic by alerting customers of damage or misalignment. The door automatically ceases closing and reverses when objects pass through the infrared beam. CodeDodger® 2 Access Security System The Odyssey™ 1000 series garage door opener integrates CodeDodger® technology, which selects a code from billions of combinations each time a wireless keypad or remote is used. For additional security, piracy of the radio signal is prevented. Automobile Convenience Features This garage door opener is companionable with Car2U® and HomeLink® car systems.